After spending nearly two months in the Philippines, we were positive that we’d visited the friendliest island nation on the planet. There was no way we could possibly find a country to rival hospitality and warmth that Filipinos displayed, a place we’d never been but that immediately made us feel like we had come home. And then we visited Taiwan, and boy did it ever prove us wrong. 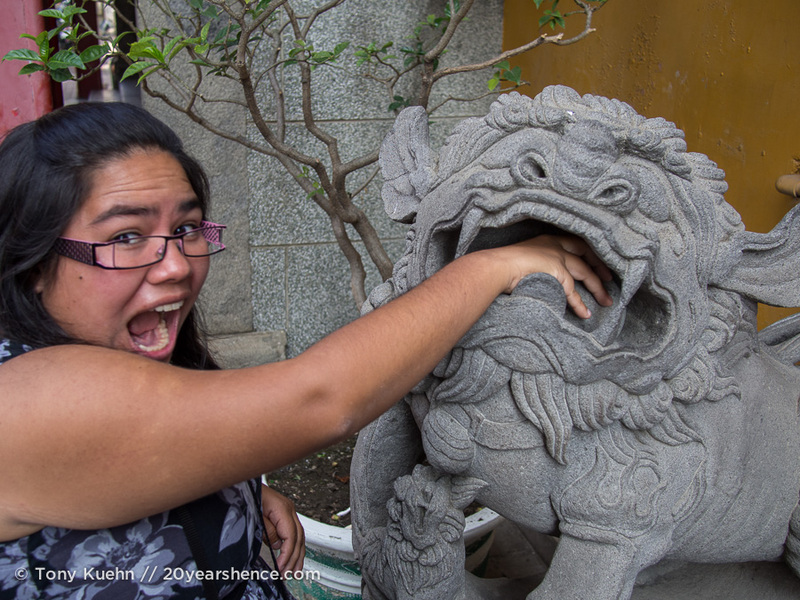 We flew to Taiwan excited to dig into the cuisine, but with the bitter taste of China still quite fresh in our mouths. Like many people it would seem, we didn’t really know much about Taiwan, but given its ties to the mainland, we were obviously a bit leery of what we would find. We needn’t have worried, because while we may have gone to Taiwan for the food, we certainly wound up staying for just about every other reason a traveler could possibly find: excellent public transportation, surprisingly clean & pleasingly modern cities, rich traditions and well-preserved history, some of the most beautiful and lavish temples we have ever seen, gorgeous natural scenery and a diversity of landscapes, frighteningly friendly locals, and oh yeah, the food is pretty amazing too. Pretty much if you took all the things that we found disappointing about China and made them good, well, you’ve got Taiwan! 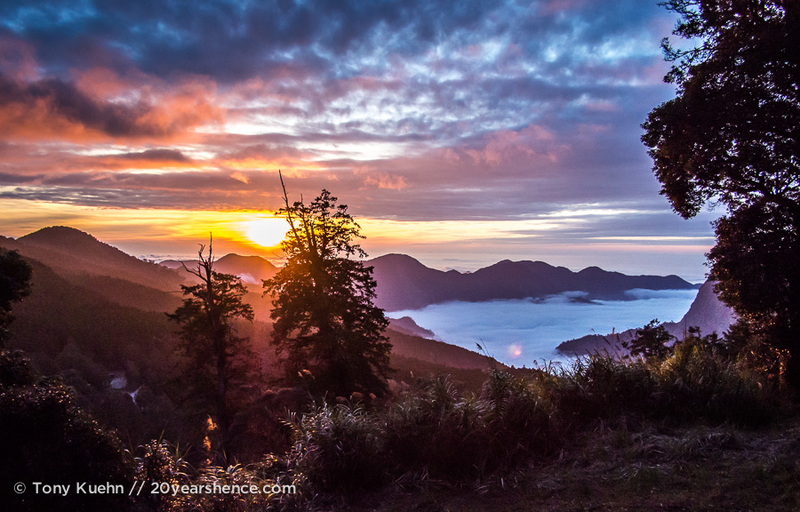 Best of all, consider the excellent quality of life a traveler can experience here, costs in Taiwan are actually quite low making it an excellent budget destination that should clearly feature on any backpacker’s Asian itinerary. Yet, Taiwan seems to be coasting along under the radar of most travelers, and we can’t for the life of us figure out why. It’s no secret that during our 3 weeks there, we fell hard for this little country and it’s our hope that our coverage on it has convinced some of our readers to bump it up their list of places to visit. If you’re smart enough to do so, read on as we share all the ins & outs of this wonderful place so that you can make the most of your time there. Striking fear into the heart of non-tonal language speakers everywhere, the official language of Taiwan is Mandarin (the same official language of mainland China). Taiwanese (also known as Hokkien) and Hakka are also spoken, though that’s hardly a comfort for most travelers as they too are tonal languages. Moreover, unlike China, Taiwan uses non-simplified Chinese characters meaning that signage is even more mind-bogglingly complicated. Don’t despair, however! Even if you have attempted to and failed horribly to communicate in Mandarin China proper, you will likely find that Taiwanese are far more conscientious listeners and you will likely be far more successful in your efforts here. Despite having not attempted to use any Chinese in nearly 2 months and having felt completely thwarted in China, we found communicating even in our rubbish Chinese in Taiwan was actually quite successful. Tony even managed to ask a waitress for cold water and be understood on his first try on our very first day in Taipei! To our untrained ear, Chinese when spoken in Taiwan seemed less harsh and far gentler and after a few weeks there, we found that within certain contexts we could occasionally pick out a few phrases when spoken around us (like the words for “coffee” or “too expensive”!). We both agreed that if we ever decide to try to learn Chinese in earnest, we will surely do so in Taiwan rather than in China. Also, rest assured that Taiwanese people are extremely helpful and should you look uncertain at all, someone who speaks English will undoubtedly come to your rescue. If you stray out of the big cities, you may find communication more difficult, but where there is a will, there’s a way, and you can breathe easy knowing that the Taiwanese will look out for you. Also, if you learn just a few phrases in Taiwanese (we used “excuse me” and “delicious!” most frequently), Taiwanese people will lose their minds and overwhelm you with unwarranted praise and enthusiasm. Reading Chinese was of course more difficult and not at all useful for us, but generally speaking there is enough English (or pinyin) signage to get by. One frustration is that some of the cities use an outdated Romanization on their street signs, which may mean that 3 seemingly different addresses are all actually for the same place (e.g., a hostel’s address may not match the name of the street as written on a tourist map, which in turn may not match the name of the street as written on Google maps) and this can be confusing and frustrating. But just remember, you’ll rarely have a chance to get lost because some helpful citizen will swoop in to save you. We went to Taiwan with the mission of eating as much food as we possibly could, but that said, apart from stinky tofu and other unappetizing foods gleaned from one episode of Bizarre Foods, we had no idea what to expect. I’d wager that most people would just assume that Taiwanese food is the same as Chinese food, and certainly there is some overlap, but make no mistake that Taiwanese food is very much its own thing. Within the country, different regions have their own specialties and because the country has a solid aboriginal population, it is possible to try dishes and styles of cooking that are unique to that district and are found nowhere else on the planet. We had the opportunity to eat at an aboriginal restaurant while in Hualien, and it was one of our culinary highlights of all time. Additionally, Taiwan has legendary night markets that rival those of Thailand, so crammed with delicious nibblies are they. Night markets are the place to socialize, shop, and get your dinner and are something you simply cannot miss. The food is always fresh, delicious, and best of all, cheap; eating gluttonously should only set you back about $3-4US. Try stinky tofu if you like, or a giant fried chicken cutlet as big as your head, or risk diabetes with snowflake ice! Hygiene standards are very high, and even when we were ordering a fried food, unlike the food we experienced in China, the food in Taiwan was rarely greasy and not once did we experience tummy troubles as we ate our way through the country. For vegetarians, Taiwan is an easy and delicious place to travel: the country is filled with beautiful Buddhist temples, nearly all of which have vegetarian eateries right next door. And if you’re worried about bland tofu dishes, fear not: the food is so flavorful and there are so many ingenious mock meats that are convincing enough that we two omnivores eagerly sought out these establishments and didn’t miss the meat one bit. Also: while in Taiwan you simply MUST try bubble tea at least once but do not drink the tap water! Although Taiwan doesn’t attract nearly as many travelers as it deserves and it certainly doesn’t have the backpacker culture of many other Asian cities, you can still find hostels in nearly every major city, along with smaller family-run guesthouses and, of course, fancier hotels, too. We found accommodation standards to be quite high: rooms were always clean, hot water is standard and—unlike China—beds were adequately soft. Everywhere we stayed, the staff were always very helpful and obliging (no surprise there), and communication was never an issue. Of course, the very best way to experience Taiwan is to forego all traditional lodging options and to try CouchSurfing instead. Taiwanese people are so incredibly friendly and welcoming that even if you have never Surfed before, this is definitely the best country to give it a shot. Taiwan has a really amazing rail network down its west and east coasts, and while you can certainly take domestic flights, the trains are comfortable, convenient, and cheap, so why travel any other way? On the west coast, there is actually a high-speed line, though we opted to save our money and spend a few more hours on the train instead (note that the high speed train stations tend to be located an inconvenient distance from the center of town, a definite downside to using them). It’s true that down near the southern tip of the country and on parts of the east coast, trains peter out and coverage gets a bit patchy, but in these cases there are always (clean, comfortable, non-karaoke playing) buses to make up for the gaps. The Taiwanese countryside is truly beautiful and the country itself is not very big, so taking buses or trains made a lot more sense to us than trying to finagle domestic flights. That said, having your own transportation would likely enhance your visit to Taiwan, particularly when outside of the main cities. I think we really only experienced the bare minimum of what we might have at Alishan if we had had our own transport as there are myriad interesting sounding villages scattered nearby, but with very limited and fickle access due to the railway through that area being permanently closed. While we could have relied on buses to get to some of them, they ran too infrequently (i.e., twice per day) to really be of any use to us. Additionally, in Hualien, we were really happy to have a scooter to tour the city and visit Taroko Gorge because the city is too large to explore comfortably on foot and the Gorge is way more fun to see at your own pace than using the shuttle bus provided by the park. Because a friend graciously loaned us her scooter, we did not have to attempt renting one, but accounts about foreigners (even those with international permits with motorcycle endorsements) successfully renting scooters in Taiwan are dicey; however, car rental is supposedly easy as can be. Within the larger cities like Taipei and Tainan, public transportation is more than sufficient and exceedingly easy to use. Taipei has both buses and a train system (MRT), the latter of which has excellent coverage (you can easily take it out to the surrounding counties, such as Beitou, to visit the hot springs) and is very affordable. We purchased an Easy Card that you put a prepaid amount on so that you aren’t scrambling to find exact change when getting on buses or wasting time purchasing a ticket each time you take the MRT and you get discounted fare on your ride; because we spent 9 days total in Taipei, getting an Easy Card was a no-brainer for us. As an added bonus, we were able to use our Easy Card on the buses in Tainan as well, and value can be added to your card at MRT stations or 7/11 convenience stores (you can do pretty much EVERYTHING at the 7/11). We chose to forego the Taipei Pass which gives you 1 day of unlimited public transport use because you would have to use the pass A LOT to have it make financial sense. Overall, we found Taiwan to be an extremely budget friendly destination although, as you will see, accommodation costs can put a sizable dent in your travel fund. However everything else: food, transportation, attractions, and even shopping tended to be very reasonable and meant we were very comfortable during our time in the country. The local currency is the New Taiwanese Dollar (denoted as $NTD) and accessing money from ATMs was never an issue. Most frequently we paid with cash, though in Taipei upscale restaurants & hotels will accept credit cards without issue. Obviously, however, these places tend to be more expensive than smaller establishments and of course you’ll need cash if you spend any time at the markets. Coming from the Philippines, entering Taiwan was like returning to civilization—technology abounds and it’s cheap & easy to stay connected. One of our CouchSurfing hosts arranged a SIM card for us, but you can pick one up at nearly any 7/11. In yet another contrast to mainland China, there is no firewall on the internet in Taiwan and speeds were lightning fast. Furthermore, unlike Japan, WiFi was easily come by and always free. Projected Daily Budget, per person: We didn’t have a budget pre-determined for Taiwan as we didn’t originally plan on visiting. However, if we went with our overall trip budget of $50/person then we were $24 (per person!) under budget! Cost of 90-day visa: Free! Other Notable Expenses: We purchased a new underwater camera (Panasonic Lumix GF-2) and housing while in Taiwan to replace our camera that leaked while in the Philippines. This came to $344 USD, but we have elected not to include it in our daily budget as we feel it is not an accurate reflection of our spending patterns in Taiwan. 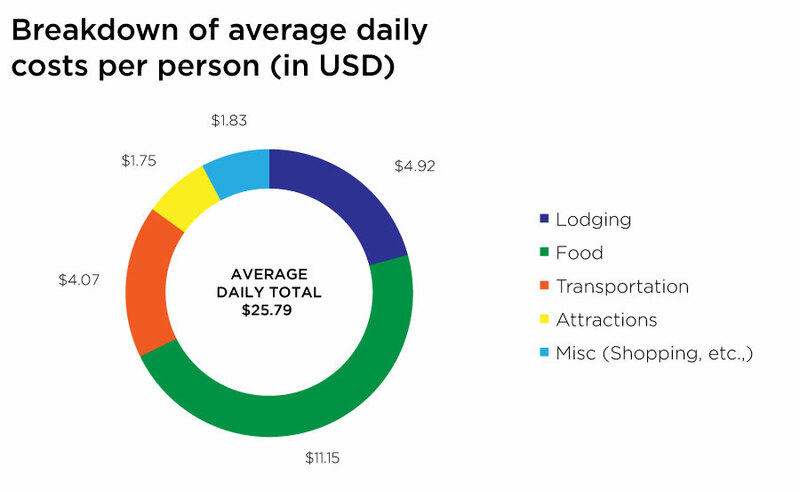 However, if we were to include it, our daily average would increase to $35 USD per person (which is still $15 under budget). A Note On Daily Costs: In our daily costs, we have separated out the cost of our flight into the country. We did this because we believe that including the price of getting into or out of a country results in a figure that does not accurately reflect our actual day-to-day costs. Moreover, not everyone will choose to enter the country in the same way or from the same departure point as we did, so we include the price we paid separately for your edification. We believe our Lodging, Food, Transportation, Attractions, and Miscellaneous Shopping costs are reasonable estimates that may be informative for other likeminded travelers; however, we believe the cost of our transportation into any country is best considered a separate lump sum expenditure, and we will continue to treat it as such. Accommodation: Before you get too excited about the low cost of lodging in Taiwan, we actually felt it was quite the opposite: although standards were very high, coming from the Philippines, we found the price for hostels and hotels a bit too rich for our budget and so opted to CouchSurf in an attempt to keep costs down. Consequently, our accommodation budget is artificially low as we only paid for lodging six out of 18 nights. Additionally, one of those evenings, we cashed in reward points to keep our costs as low as possible, taking a $60US room to $15US, and we opted to stay in hostel dorms for the remaining 5 nights. If we were to average across the six nights we paid for accommodation rather than across the entire 18 days in Taiwan, then our costs for lodging increase to $12.64 USD per person. This is a far more realistic number for travelers to budget, but only if you are willing to stay in dorms. If you require private rooms at hostels, you should budget at least $15-20 USD per person, and even more if planning to stay in hotels. Overall, we did find the cost of travel in Taiwan to be very affordable, with the exception of lodging. For more information on the few places we stayed during our time in Taiwan, check out our Lodgings page. Food: We went to Taiwan with the goal of eating, so it only makes sense that food would be our highest daily expenditure (talk about getting our priorities right!). That said, food in Taiwan was really reasonable, especially if you eat your dinners at night markets. We tended to only eat 2 meals per day, but often picked up a small snack along the way (I may have become briefly addicted to 7/11 hot dogs…), and of course there was Tony’s daily bubble tea, which always proved quite filling. Our daily food costs may be slightly elevated because when we CouchSurf, we tend to treat our hosts to at least one meal as a way of saying thank you for their generosity, so some days we were paying for two additional people. 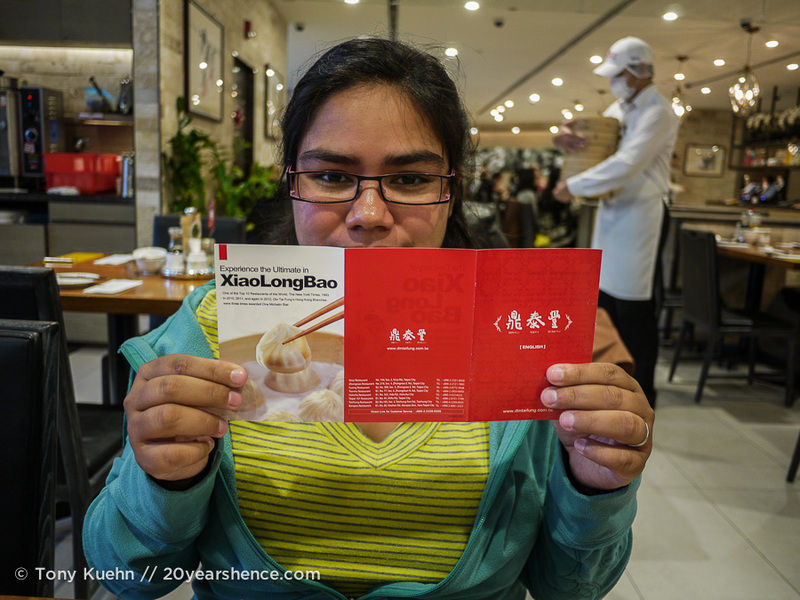 But generally speaking, if you budget $5US per meal, that should be more than ample and allow you to eat frugally at night markets but also splash out a bit for nicer places (like Din Tai Fung). Transportation: Our low transportation costs emphasize just how affordable getting around Taiwan really is, but belies just how comfortable and convenient doing so is! 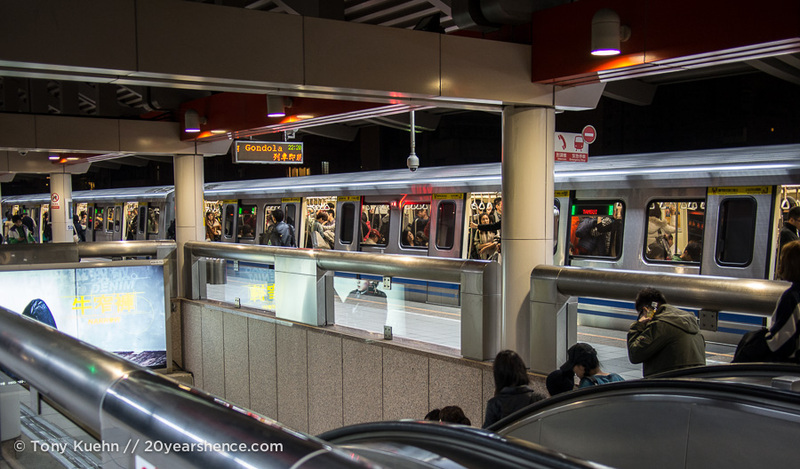 We found the trains and buses in Taiwan to be extremely good value, and although the trains may not have been quite up to the same standards as in Japan, they were pretty darn close and at a fraction of the price. We found that by and large, getting around cities in Taiwan was as easy as getting between them and although we did a lot of walking while we were exploring, public transportation was always really reasonable, with bus rides rarely costing more than $1US and local train rides costing just slightly more. We did have a scooter for a few days in Hualien that we did not have to pay for as it belonged to a friend, so our transport costs may be slightly lower than other travelers, but likely not enough to be significant. Attractions: Taiwan is a country filled with beautiful attractions, both manmade and natural. What’s even more incredible is that they are all incredibly cheap, and in many cases, totally free! 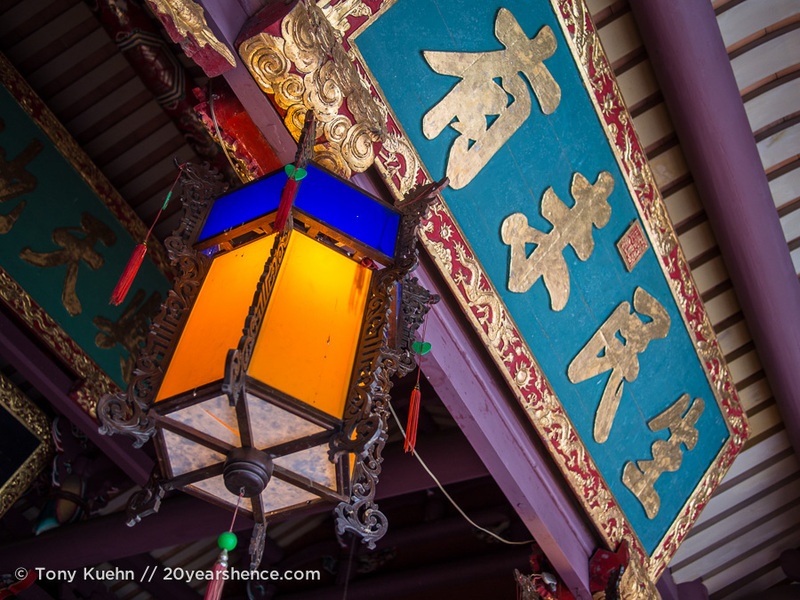 Taiwan’s temples are some of the most beautiful ones we have encountered and impeccably restored, but not a single one charged an admission fee. In Tainan, a few of the historic forts charged an entrance fee, but these tended to be less than $2US per person. Museums will generally have an admission fee, but these will rarely be more than $5US per person, and that’s generally only in Taipei where things are more expensive. For those that enjoy natural attractions, the national parks are very cheap to visit: our pass to Alishan cost ~$4US per person, and Taroko Gorge was completely free! If you feel your budget is being strained, get out of the cities and head to nature and your wallet will likely thank you. 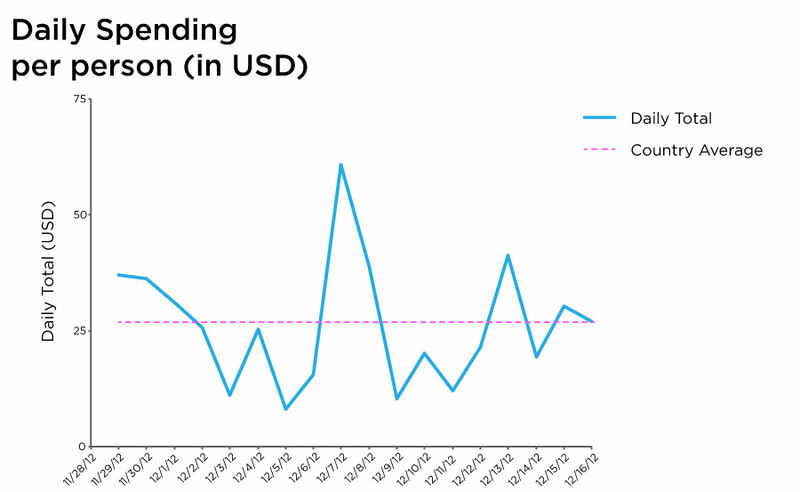 This figure plots our daily spending per person during our time in Taiwan so you can get a better sense of how our daily average evolved. I know it’s basic math, but so often we encounter travelers who pick a daily budget and then refuse to spend a penny more than that, even though you will certainly have days when you are well under budget. We hope this helps illuminate our spending habits, and will serve as a reminder that you can have crazy splurge days and still do ok.
Hidden gem: Taiwan seems to receive so few visitors that nearly the entire country feels like a hidden gem, truth be told! Get out of Taipei and immediately the beaten track falls away. We didn’t really try to trailblaze while in Taiwan, but given that most people visit Hualien expressly for the purpose of visiting Taroko Gorge, we would say that spending a few extra days exploring the surrounding area would be well worth it and far fewer visitors bother to do so than such a beautiful area deserves. Best Lessons Learned: Although we already knew from our time in Japan just how incredible the connections you form through CouchSurfing can be, Taiwan reinforced this 1000 times over. Sometimes it is easy for us to get wrapped up in our own little world rather than pushing ourselves outside our comfort-zone and opening ourselves up to others, but Taiwan was a great reminder of how personal connections with the locals really elevate destinations for us. It’s not always easy to place your faith in strangers, but in Taiwan we were repeatedly humbled by the kindness, welcome, and generosity we experienced from fellow human beings. For us, it is always worth the extra effort and risk to reach out and connect with others because those personal experiences wind up meaning more to us than any attraction you’ll find in a guidebook. Also: it is never a mistake to let your stomach navigate and choose destinations on the basis of food! If we could do it all over again? We are incredibly happy with the time we spent in Taiwan, but probably the one biggest regret we have is that we didn’t have more of it! With 18 days, we did little more than scratch the surface of the country and there are so many places we didn’t get to go. In retrospect, we probably spent too much time in Taipei (though we loved it so much, so fast that for a while we were considering just hunkering down there for the entire duration of our stay!) and because of the poor weather we experienced, we didn’t get to do some of the daytrips we had wanted to. On a return visit, we would certainly make an effort to visit to get out of the city and check out places like Wulai, Pingxi and Jiufen. Additionally, it would have been nice if we could have explored some of the surrounding villages around Alishan such as Fenchihu and Ruili; alas, our lack of private transportation meant seeing anything other than the park proper was a real pain. We didn’t visit anywhere on our trip that we thought was a dud, but we missed out on many places in Taiwan that we’d certainly want to visit next time. We didn’t get to see the Sun & Moon Lake, Taichung, or Kaohsiung, nor did we get to go as far south as Kenting, which is supposed to have some lovely beaches and feel very tropical indeed. We also only got the slightest taste for the east coast, but it was absolutely gorgeous and we think doing a scooter trip down that side of the country would be fabulous. I kind of can’t believe I’m saying this, but we only got a tiny taste of the many dazzling hikes that Taiwan offers and I’m confident that when we return one day, we’ll make it a priority to experience more of them. Speaking of missed experiences, Taiwan has many amazing, beautiful festivals, and we unfortunately weren’t present to observe any of them. I’d love to witness or take part in the annual lantern festival over in Pingxi, which is much like the Yi Peng that takes place in northern Thailand. One day! We fell fast and we fell hard for Taiwan. Most surprising of all, our love stemmed for reasons that went far beyond the demands of our stomachs. Looking back, there’s not much we disliked about our time in the country (save for the unfortunate weather), and it’s pretty safe to say that Taiwan has been one of our very favorite countries to-date. It may not be the absolute cheapest country you’ll encounter on your travels, but with all the good parts of China (but none of the hassle!) and many of Japan’s good points (but at half the cost! ), you’ll undoubtedly find your time here very rewarding. Not only do we struggle to understand why such a great place gets overlooked by so many travels when ambling about Asia, but we also routinely battle the nearly overwhelming desire to just shrug and say “more for us!” and just hop on a plane back there. Though neither of us set out on this journey with the purposeful intention of auditioning countries within the framework of viewing them as places we might one day call home, both of us agree that not only is Taiwan an excellent and interesting place to travel, but is one of the few countries we’ve encountered where we could legitimately see ourselves settling down, for at least a year or two… someday! When you’ve got wanderlust as bad as we do, surely that’s saying something! And I also noticed Taiwanese are active listeners. Instead of laughing in your face or walking away or acting confused, they know you’re actually trying to ask for – in your case, water – or something else. I fully admit that prior to visiting Taiwan or really leaving on our trip I was as ignorant about the country as most people are, but the great thing about travel is how it really does open the world up to you. We have definitely met people who thought Taiwan was boring because it was a “diluted version of China” and had no identity of its own, but I think those people must not have been looking very closely because that wasn’t our experience at all. Yes there are certainly influences from the mainland in Taiwan, but there’s so much more to it than just viewing it as a rich offshore holding of the mainland. I can’t wait to return one day and explore more of its rich diversity! There are quite a few tea villages around Taipei that it would have been nice to visit on day trips but the terrible weather did us in and we never made it to any of them. I’m not a tea aficionado by any means (I like the stuff but am not a connoisseur) but I think your idea of doing a tea tour sounds awesome! I know a few people (friends of friends) who have taught English in Taiwan and loved it. It’s always seemed so under-the-radar to me as well, but I’m seriously wanting to go now! When we started this trip, we really never considered the possibility of spending a year somewhere teaching English, but we both loved Taiwan so much that we have agreed it’s something we should consider for the future. It’s such an amazing country so I’m not surprised to hear that your friends so greatly enjoyed their time there! Awesome summary! We’re seriously thinking about visiting Taiwan, since it’s a pretty much just a hop,skip and a jump from Japan. The night markets really sell it for me – they were definitely one of my favourite things about Thailand. That, and the fact that everyone who has visited only has wonderful things to say about it. Having spent as much time as you have in Japan, I think you’d really get a kick out of a visit to Taiwan. It’s not Japan-lite, but it’s definitely got certain influences (like an obsession with making things cute!) that are really interesting to behold. And of course, apart from Osaka, Japan doesn’t really do street food so certainly in that respect Taiwan gets a leg up… those night markets are the stuff of dreams and can seriously give Thailand a run for its money! I love that the food cost takes up almost half the budget. Seriously, are we the same person (people)? Ha. Taiwan has been on my radar for a few years now, and I have been hearing nothing but good things about it. i have to echo what you say about not knowing why more people don’t go there. I tried to plan a trip there a couple years ago, but those plans changed and/or fell through. This is such a great post for someone like me who still fully intends to visit Taiwan one day. I have a Taiwanese friend with a very interesting background (just search for Achilles on my blog), and he is also one of the most hospitable people I know. And ALWAYS cooking up something tasty. The fact that food took up half our budget really should be all anyone needs to know about why visiting Taiwan is so amazing! Clearly we both have our priorities in order… 😉 I really hope you wind up visiting Taiwan one day, though it sounds like your friend Achilles has definitely given you a delicious taste of what you can expect once you’re there (pun totally intended!). If we ever decide to live in Asia again, Taiwan will be near the top of the list of places we’d like to call home! I have heard nothing but good things, and this just adds fuel to the fire. Yes, after your time in China I think you’d find Taiwan a really interesting juxtaposition. I’m sure it has its own set of challenges for expats, but I seriously doubt it would be anywhere near as challenging as China! I’m slowly but surely convincing Shawn that Taiwan should be high on our list of considerations. Bookmarking this one for later reference… Thanks guys! Wow, what a great resource! We’re very likely adding Taiwan to our trip next year, will definitely remember these great tips when we do. I’m so glad to hear you’re considering visiting Taiwan next year! It’s a really lovely destination with a lot on offer and offers a very different take on Asia than places like Thailand, Cambodia, and Vietnam. Those places are definitely popular for a reason, but they are just part of what Asia is all about! Andrew and I have just read this post with great interest; we’re keen to visit Taiwan (partly due to reading your stories) before we leave Asia in May. We’re planning to scope it out as a possible place to live and work for a year in 2014 to replenish our travel savings; Andrew has heard that it’s a great place for teachers to work. All your info on living costs is reassuring too, the only thing that seems a bit high is accommodation, as you point out, so we might have to try and couchsurf when we visit too. I don’t suppose you picked up on how much it might cost to rent an apartment out there? We didn’t really look at apt rentals while we were in Taiwan, but you should absolutely check out A Cruising Couple’s website as they have just recently wrapped up 2 years of teaching in Taiwan and have way more information on the country especially from that perspective than we do! They recently published a great ebook on the ins & outs of living in Taiwan that would definitely be of use to you. That train picture looks very snazzy! Much cleaner and more technologically advanced than anywhere I’ve been before! I don’t hear too much about people going to Taiwan, so thanks for sharing. I feel I know it much better now. Hello Steph! This post was great. Very informative. Couchsurfing… I’m looking forward to trying that out when I started traveling! I’m definitely up for it. Also, Aboriginal cuisine – that is something I’d really like to experience. Thanks for taking the time to comment Marissa, and I’m glad you found this post useful! 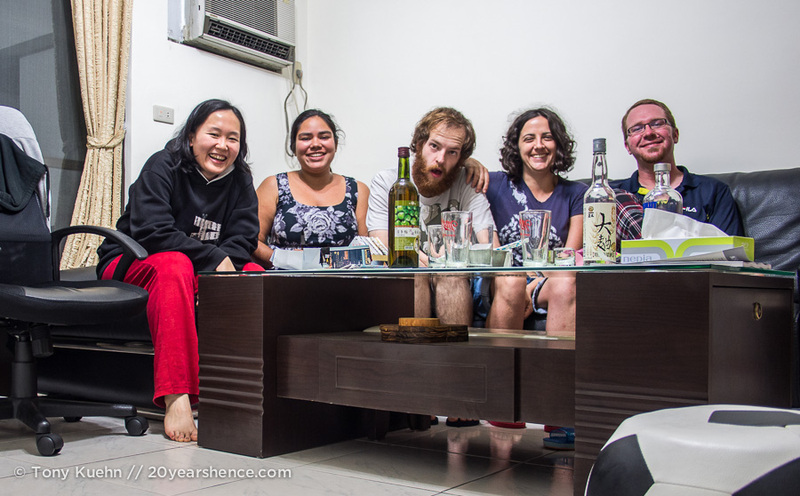 This trip has really taught us so many things (like how awesome CouchSurfing is!) so it’s great to have the chance to pay it forward and help our fellow travelers out. Hi Steph, you know I’ve learned so much about Taiwan from you posts. Honestly, It was not within my radar of interest, but it has now moved higher on my travel list. I used to think of it as a smaller version of the mainland. It’s great to learn from you that it’s a better and improved version. 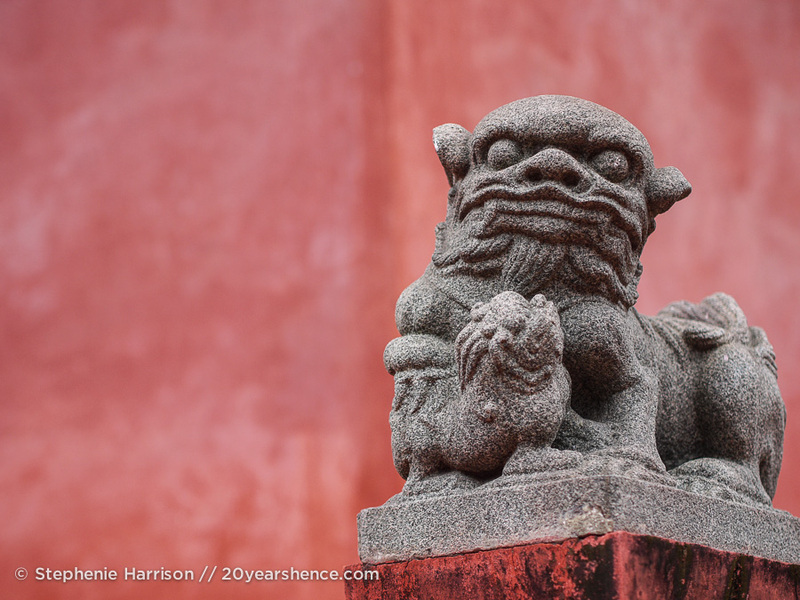 I’m so glad to read that our posts have helped you view Taiwan in a new light. I really cannot stress how different it is from the mainland and while I can understand how people who have not visited would think it might just be China on a smaller scale, it’s really a completely different place and worth visiting. Thank you so much for such a detailed Taiwan guide. It will definitely help me to plan my trip to Taiwan Next year. Glad to hear it was helpful, and I hope you enjoy your trip! Great post guys!! I hope to make it to Taiwan one day. The food really looks tempting. I wanted to pin this post, but your cover image was invalid (check it out). I can’t believe you met France and her partner, we love these dudes!! I know you have really loved China so I think you definitely need to spend some time in Taiwan and see another facet to the Chinese empire! I’m not sure what issue you were having re: pinning the image for this post (I assume you mean the temple one at the top of this post?) as I had no problems pinning it to a board. Were you trying to pin a different image? I feel your pain—Cambodians are such sticklers for pronunciation and they use so many sounds that I either can’t hear or can’t make! I had hoped that Khmer being a non-tonal language would mean it would be easier to communicate, but if anything I think it was worse than our attempts in China, Taiwan, Vietnam and Thailand! Awesome breakdown of Taiwan! It really is sad more travelers don’t make their way there. The food, culture, landscape are all incredibly diverse. And don’t even get me started on how friendly everyone is! :-p I’m glad you had such a great time! Casey @ A Cruising Couple recently posted..Is Couchsurfing Still Right For Us? My Mum has international students from Taiwan and they’re so nice it makes me want to go there! Am not surprised you rated it high for friendliness! Thanks for stopping by and taking the time to comment, Steph! Very jealous that you get to live in Taipei, and we’ll be sure to live vicariously (while seething with envy) through the stories you share on your site. 😀 No plans to move to Taiwan just yet, but maybe someday! Taiwan is definitely up there on our list of favorite countries we have visited. We are definitely keen to return and spend more time exploring it… three weeks definitely wasn’t enough! I just wanna express my liking to your very organized, comprehensive and helpful blog about this trip. I am planning to have my trip as well this coming November and I really find your blog worth reading. The topics are clear and have flow. Your photos are breathtaking, as well. I just hope my travel will turn as wonderful and remarkable as yours. BTW, I appreciate you introductory impression of my country (Philippines). Looking forward to more of your travels. Thanks for taking the time to comment Mon, and I’m glad you found our posts on Taiwan so helpful. I hope you have an amazing time on your trip to Taiwan! Glad i found your blog.. travelling taiwan is not easy for my friends they’re from other countries which they need a visa.. well everything is ready for the travel… we are all excited! thanks for sharing.. Thanks for sharing this. I feel like the cost of things is pretty on par with my experiences. I’m super interested in the aboriginal cuisine you mentioned as your best meal. I appreciate your information on Taiwan. My husband & I are definitely going to Asia, but yet to decide exactly where. We were considering Cambodia or Thailand, but after your input on Taiwan, we have added it to our list. Thanks, now we have another place to consider. We honestly do appreciate your great run-down of the costs, food, lodging budget, places to see & foods to enjoy. We’ll have to let you know where we decide, if not all!